The Big Store film was intended to be the Marxes' farewell as a team and had the working titles Bargain Basement, Step This Way and Gin Rummy. It was released by M-G-M on 20 June 1941. The basic idea of the film and the characters of Groucho (Flywheel) and Chico (Ravelli) derived from an episode of the Flywheel, Shyster and Flywheel radio show. Nat Perrin was a writer on the series and also made the original treatment of this film. Another old routine which was resurrected is Chico's and Harpo's piano switch from Home Again. The trailer for this film is also worth mentioning. 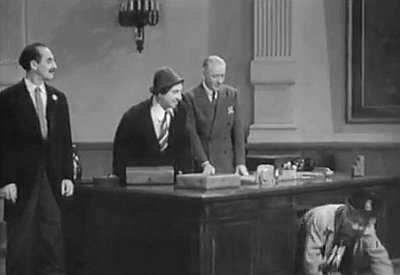 It starts with an executive, played by Henry O'Neill, sitting at his desk when he interrupts his duties to address the audience. He speaks about legendary French actress Sarah Bernhardt and her many lucrative "farewell" appearances. O'Neill than goes on to make a "most important announcement", .i.e. 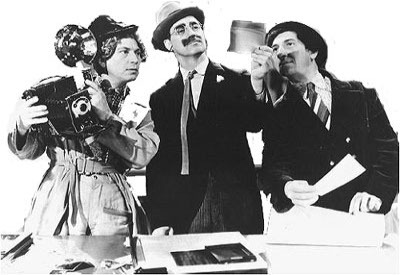 that the Marx Brothers are retiring from the silver screen. 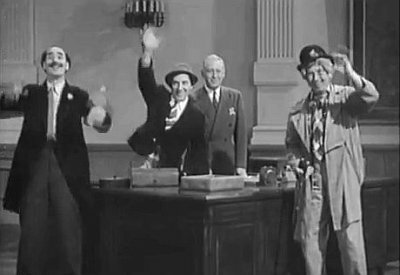 Groucho (loping in from the left): That's right, folks! We're on our way! Chico (popping up from behind the desk): That's right, folks, but where do we go from here? Harpo climbs out from beneath the desk, waving and honking his horn. Distracted by the sound of voices, they all head for the window. Outside is a vast crowd crying: No! Groucho We...we didn't know you cared. Even if the Sarah Bernhardt-anecdote is excised in most copies - thus weakening the point of the "first farewell picture"-gag - I find the trailer interesting as it forms a kind of cinematic Epilogue, neatly matching Theatrical Agency, the natural Prologue. 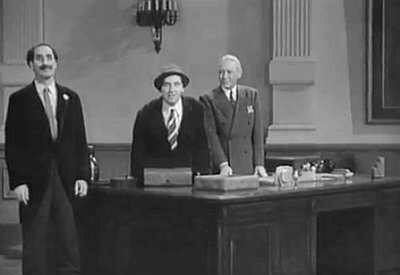 The visual settings are similar and show the Marxes visiting an office and even if The Big Store-trailer is much shorter and much less elaborate than Theatrical Agency, Groucho seems to deliver his lines in a rhyming fashion reminiscent of the older piece. There's also a kind of strange balance where two pictures (The Cocoanuts and Animal Crackers) are preceding Theatrical Agency (the trailer of Monkey Business) and then - likewise - two pictures (A Night In Casablanca and Love Happy) following The Big Store which indeed became only their FIRST farewell picture. Groucho: You can use potassium or silver nitrate. Chico: Use the night rate. It's cheaper.